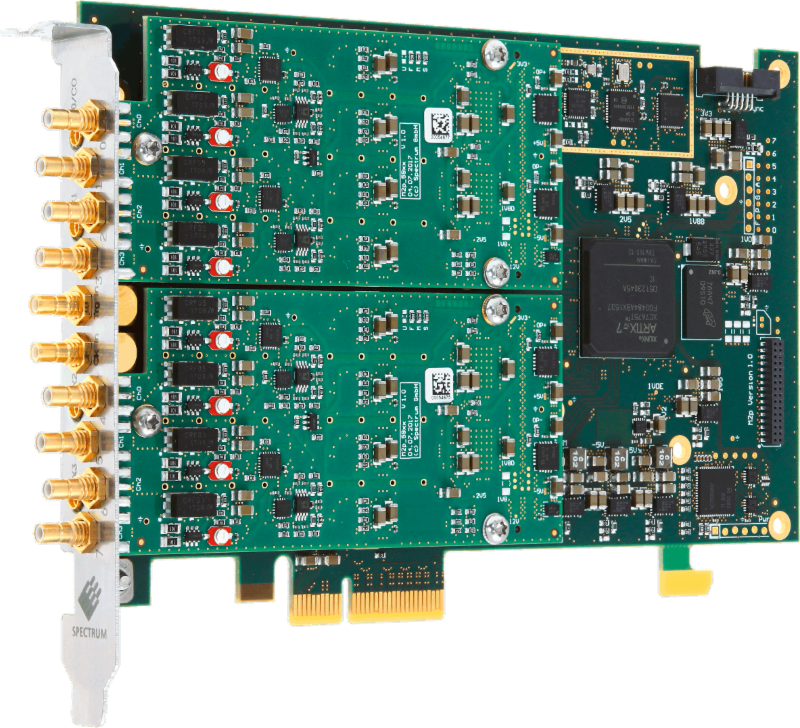 The M2p platform board from Spectrum Instrumentation provides modular digitser construction capabilities for test and experiment design. Spectrum Instrumentation announces the first products of a completely new designed digitiser card series. It consists of the new platform-board M2p, which will be the PCIe base for all forthcoming products for the next years. The other part is the new 59xx module, which will be available in many variations. M2p platform and 59xx module form 13 different new digitiser cards with lots of options regarding speed and channels. The M2p.59xx series is initially available with three different speed grades of 20 MS/s, 40 MS/s and 80 MS/s and from one to eight channels per card. Based on Spectrum’s unique modular design philosophy, 13 different models can be ordered ensuring a perfect match against the required specifications of customers. More models will be released in 2018. Although the size of the product has been squeezed into a half-length PCIe card by the design team, it still offers even more features than predecessor families. Each channel has a separate ADC and a fully individual programmable input amplifier with ranges between ±200 mV and ±10 V, programmable input offset for unipolar measurements, programmable input termination of 50 Ohms and 1 MegaOhms and an integrated calibration circuit. Models are available with up to 8 single-ended and up to 4 differential channels. The reduced card length of 167 mm allows the powerful 16-bit digitisers to fit into much smaller PC systems than before – perfect for compact OEM systems. A PCIe x4 lane interface dramatically increases the available streaming speed to more than 600 MByte/s – or more than 75 MS/s continuous streaming for 4 channels. That compliments the impressive on-board memory of 1 GByte and enables applications that need continuous data storage or fast online calculations. Intelligent acquisition modes like multiple recording, gated sampling or ABA – the combination of fast and slow continuous acquisition – matches nearly every application demand. Up to 16 cards in one system can be synchronised using Spectrum’s proven star-hub technology. That allows systems to be created with up to 128 channels, all sharing a common clock and trigger, in one single chassis. For synchronisation with external equipment, clock and trigger inputs and outputs are standard. For even more flexibility, 4 individually programmable connectors are available directly on the front-plate that offer additional trigger inputs, status outputs, synchronous digital input lines, asynchronous I/O or a reference clock input for an integrated time stamping unit. The new card is based on Spectrum’s own general driver API that was introduced in 2006. Nowadays more than 400 different products share this common driver library allowing easy switching from slow to fast products and combining PCIe, PXIe or Ethernet/LXI products with one common software interface. A complete SDK based on Windows and Linux is included in the delivery. Drivers and examples for nearly every programming language on the market are included leaving the decision of the preferred programming interface to the customer. The current SDK includes C, C++, C#, Delphi, VB.NET, J#, Python, Java, LabVIEW, MATLAB and LabWindows/CVI. All units are shipped factory tested and include a base version of Spectrum’s SBench 6 software for first tests and simple measurement tasks. The Professional licence of the software adds full support of all acquisition modes, a large number of calculations and new displays, project control and reporting.